It’s official. The PlaneCrud I have been fighting all week has taken hold. Victor succumed to it a couple of days ago. I fought. I really did. But in the end, it was too much for me. It’s settled in the chest. I’m hacking away. I suppose I could go to the dugstore and buy any number of really expensive cold remedies, but the only thing they’re really guaranteed to do is to extract money from my checking account. I’m still going to feel like hell, but $40.00 poorer. No thanks. 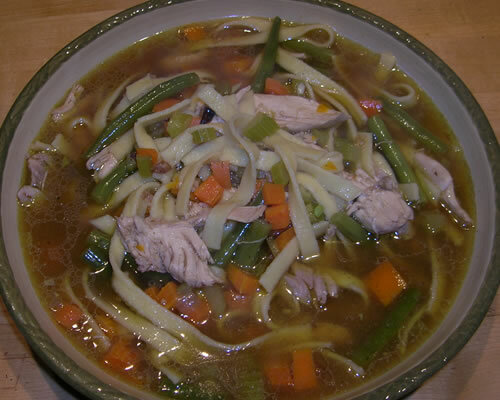 Time for Mom’s Cure – Chicken Soup. I’m a product of the ’50s… Doctor’s made House Calls (can you imagine?!? ), medicine was expensive (even back then), and chicken was sold with bones. We didn’t eat a lot of chicken – in those pre-factory-farming days, chicken was expensive – but when we had colds, chicken soup was an automatic. Looking back, more of it probably came out of a ten for a dollar Lady Lee can than a simmering carcass, but those simmering carcasses did make appearances now and again. Mom made really good soups. So we fast-forward 50+ years and I have a $13.00 organic, free-range whole chicken (I’d rather pay more money than support those factory farms) ready to go into the pot. It’s a good-sized bird, so I decide to cut it in half and make a smaller batch of soup and freeze half for later use. I may feel like hell, but I’m still thinking portion control. Into the pot went a splash of olive oil, then half an onion, diced. After it had wilted a bit, I added the chicken and a couple cloves of chopped garlic. About a cup of white wine and then 2 quarts of chicken broth (also organic, free range. One must be consistant). I let the chicken cook about an hour, then pulled it out of the pot, added 3 diced carrots (unpeeled), 3 stalks of celery, diced, and a hefty handful of fresh green beans, trimmed and sliced. I shredded the chicken, added it to the pot, and dinner was served. It was sixty years ago this morning, that she gave birth to my big brother, Mike, at French Hospital in San Francisco. Happy Birthday, Mike! After all these years, it’s finally better being the younger brother! And I’m thinking that this may be an early-to-bed night. Hurry up and get dark!